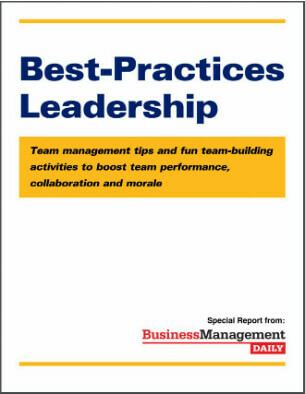 Claim your FREE copy of Best-Practices Leadership: Team management tips and fun team-building activities to boost team performance, collaboration and morale! Read how businesses of all sizes are getting creative with team-building icebreakers and fun team-building activities in this new report. Don’t forget to take our leadership assessment exercise to gauge your own performance as a team manager. After years of reporting on leadership and team management, we’ve created this report of our 15 best tips. Inside this report, you’ll get 15 eye-opening tips on how to improve your leadership team management and motivate your employees. Read case studies of team-building exercises — what’s worked and what hasn’t. “Hot teams” improvise, do more work with less supervision and make the extra effort to follow through. Management consultant Laurence Haughton suggests six strategies for turning ordinary groups into hot teams. Among his advice, Haughton cautions managers not to become too rule-bound. Rules, intended to streamline and safeguard work, can hamstring your operation when common sense calls for exceptions. Before setting rules, ask if they’re really needed. Get more of Haughton’s leadership team management advice on building “hot teams” in Best-Practices Leadership. 1. Know when a team-building exercise is successful. How will you know if you’ve achieved your goal? 2. Make sure the team-building exercise relates to solving a real problem. During Ford’s off-site event, Carolyn Lantz, executive director of brand imaging, gave executives $50 each and put them on a bus to an Old Navy store. “I told them, ‘You have 20 minutes to find and purchase an outfit that you have to wear tomorrow. You are busy people looking for great design at a great price. Those are Ford’s customers.’” The exercise made a point: Ford’s products need to be well designed, but democratically priced. Inject new blood. Invite a few high-energy types to join the team. Don’t put them in charge or they’ll threaten the team leader and the informal hierarchy that’s already formed. Instead, just ask them to lend their talents and revitalize the group. Tape the team. When a lethargic public speaker needs to liven up, a smart speech coach will videotape the individual’s presentation and play it back. By raising the speaker’s self-awareness, the tape serves as a training tool. The same goes when you want to jolt a team to rise to a higher level. Lecturing a team to improve might fall upon deaf ears, but a videotape of their meetings can show them just how listless they’ve become. Turn your team into trainers. Form a new team, and ask your current group to serve as an “advisory board” to it. Strip away routine. Study how a tired team got that way. Disrupt predictable patterns by having the group meet in new places (a nearby park, a client’s facility, your home) and work together in new ways. Host an outing. Invite the team to join you on a weekend hike or family picnic. Schedule fun activities so that participants get to know each other with their guard down. Discover the five strategies that can help you reinvigorate your team and fight off complacency in Best-Practices Leadership. The Wisdom of Teams: Creating the High-Performance Organization by Jon R. Katzenbach and Douglas K. Smith, one of the first books to define the team phenomenon, still offers some of the best advice for managing them. Find out how to get your stalled team unstuck. Remember that every player has a special need for one of these things: motivation, reassurance or technical help. Determine what that need is and meet it. Deliver tightly focused, positive messages, such as a quick word of praise for a good play. Simple words of appreciation are more powerful motivators than many leaders expect. Work hard to establish rapport with team members from backgrounds that are different from your own. It does take extra work, but the results can be extraordinary. Let team members know that you accept the full range of their emotions, including fear and uncertainty. Unless people admit their fear, they will never be able to confront obstacles and grow. Find out which fun team-building activities administrative professionals recommend in Best-Practices Leadership. They deal constructively with conflict. They are committed to doing well. They feel personally accountable for the team’s success. They focus on achieving results as a team, not just as individuals who happen to work together. Is your team the ideal size? When it comes to the ideal team, more is definitely not merrier. That’s according to researchers who study well-functioning teams. If you’re finding it tough to accomplish much with a team project you’re working on, consider whether you have too many heads on the task. Why close-knit teams don’t always win? Findings suggest that close-knit teams are often less competitive than teams in which camaraderie is weak. Sociologists at the University of California and elsewhere, who have been studying effective teams, see some compelling reasons why friendly teams finish last. Find out why a competitive team is often a more effective team in Best-Practices Leadership. To refuel a sputtering team, redirect the group’s focus away from easy, safe tasks to more ambitious stretch goals. Motivate them to “think big” by dangling fresh, meaningful rewards for stellar effort. Offer to give each team member a choice of three prizes if the group attains specific, measurable objectives. • Take strong action against them, no matter how popular they are. Giving preferential treatment to someone who’s not delivering results sends a signal that you’re afraid of him—hardly the message you want to send through the ranks. • Avoid politicking against negatives. It’s tempting to try to build consensus against them or express your frustrations to other members of your team. Be careful, since doing so can degenerate into a power skirmish that will erode your integrity as a true team leader. Caution: ‘Fun’ team-building activities could land you in court! Recent case: A California security company staged employee team competitions to boost its sales team’s unity. Part of the exercise involved spanking members of the losing teams with yard signs. Other “fun” punishments: Employees were forced to eat baby food and wear diapers. Find out what team-building exercises it’s wise to avoid in Best-Practices Leadership. Fun team-building activities: Bring out the Legos! Bring out a set of Legos at your next team meeting or at the first meeting of a new team. Look for a set that includes different shapes. Build a structure that represents your team’s project or goal, the work of your group or organization, and the mission and vision that you have established. It could be where you do your work, a piece of art or piece of equipment needed for your job. Allow five minutes to decide your team’s goal or vision and to plan how you’re going to build your structure. Allow 10 minutes to implement your plan and complete your structure. Discuss the following at the end of the exercise: As your group worked to identify its goal, what are some things that helped you be successful, and what are some things that hindered the group? How can you use what you learned? To strengthen your team’s performance, you probably embrace the notion of continuous improvement. By always looking for ways to teach your team new skills and holding it accountable for steadily better results, you send a message that you won’t accept complacency or a halfhearted effort. That’s a good start, but how about your own performance? Take Business Management Daily’s leadership assessment exercise to gauge your performance as a team leader in Best-Practices Leadership. Encourage your team to ask you the hardest questions they can think of, not the easiest. That’s what the Dalai Lama asks journalists to do when they interview him. It’s a leadership practice that’s worth copying. Poll your team members to find out where they’d like to see your organization next year, in the next five years and on into the next decade. Post responses on a whiteboard, and use them to brainstorm for a new, shared sense of mission.